The Perseid meteor shower was upon us again. With the horrible weather we have had lately, I didn’t expect to have a chance to view or shoot it. I was pleasently surprised as the peek drew closer that the forecast was showing mostly clear skies, though temperatures were in the 90’s and humidity in the upper 90’s! I decided despite the bright Moon and having work, to go for it. They predicted this would be an outburst with more than normal expected. I staged all of my gear at the front door, set my alarm for 1am with the plan to arrive to my dark site right at Moon set, around 1:30AM. My alarm went off, and as per normal, I debated if it was worth it. I decided with all the bad weather I needed to take this chance to get under some clear star covered skies. I packed the car, covered myself in bug spray and headed out. There were a small handful of people at my top secret (public boat ramp) dark site. Not surprising as last year when I went out, there was a photography club there shooting the meteors. This year I actually ran into one of the photographers who was there last year. With the dew covering my windshield and keeping my lights off as to not ruin everyone’s shots and night vision I stopped short of my intended spot as to not accidentally run anyone over. My camera and lenses became soaked with dew the second I opened the camera bag. Lesson learned, focus before heading out to a dark site and tape the lens. I was wise enough to bring my dew heater with me, but it took a few minutes to clear the lens. But focus was achieved and settings were, well, set. I had the camera clicking away and I grabbed my chair to look up into the stars and watch the show. Sadly even my dark site isn’t very dark, but I was able to see a few shoot across the sky. It was nice to just be under the stars again. Then it happened. 10 minutes or so after I had set the camera, a bright flash of light. I could clearly see the green and purple in the flash. I shouted out in excitement when I saw the flash, but what happened next was even more exciting. The meteor flashed and turned to gas! I could see vivid color in the gas as it dissipated into the air. I couldn’t believe what I had just seen. Then, I realized that was in the general part of the sky that my camera was shooting. I wanted to rush to the camera and see if I had captured it. But I didn’t want to miss anything else by messing with the camera. It was killing me not knowing! Well, obviously it was, or else I wouldn’t bother posting about! I was thrilled scanning through my images to see I had indeed captured it. I did a process of the frame with the bright meteor, and made a video sequence of the event which you find below. It was 9 images at 15 seconds each. The video is played at 30 FPS, so it’s fairly short, but it’s in a 40 second loop. It’s best viewed in HD. This was captured with a Canon T3i, a Sigma 18-55mm lens at 18mm f2.8 ISO 800. So I got a new camera and filter wheel. I finally got a monochrome camera. Why a monochrome camera? Well because for astronomy different objects produce light at different wavelengths, some not easily visible by normal color cameras. Having a monochrome or “mono” camera adds a bit of complexity to capturing images, however because these cameras lack a color matrix over the sensor, they are more sensitive to light. There is also the benefit to being able to capture only the light that you want. This helps eliminate problems with light pollution or even a bright Moon that would otherwise washout the target. This camera is a cooled CMOS camera with a 3/4th size sensor. It’s sensor is a bit smaller than an entry level DSLR, the camera is cooled with a fan and a heat skink, providing a cleaner signal without thermal noise. In front of the camera is a filter wheel that houses 7 filters which I will explain. Luminance filter: This is basically a clear filter that blocks infrared light. This lets all other light photons to hit the sensor. For a normal “broadband” image, this is the foundation of the image. As you can see, the RGB filters span about 100 nanometers. This is considered broad band. Buried in those wide bands are narrow bands. For me, narrow band is the whole end game for getting a monochrome camera. While RGB spans 100 or so nanometers each, narrow band filters pass only single digit nanometers or light, usually. Some pass up to 12nm of light. So why, if these objects are so far away, and so faint would someone want to cut down the amount of light getting to the camera? Because these objects in space emit at very specific wavelengths. By blocking everything else, you are only getting the object you want. 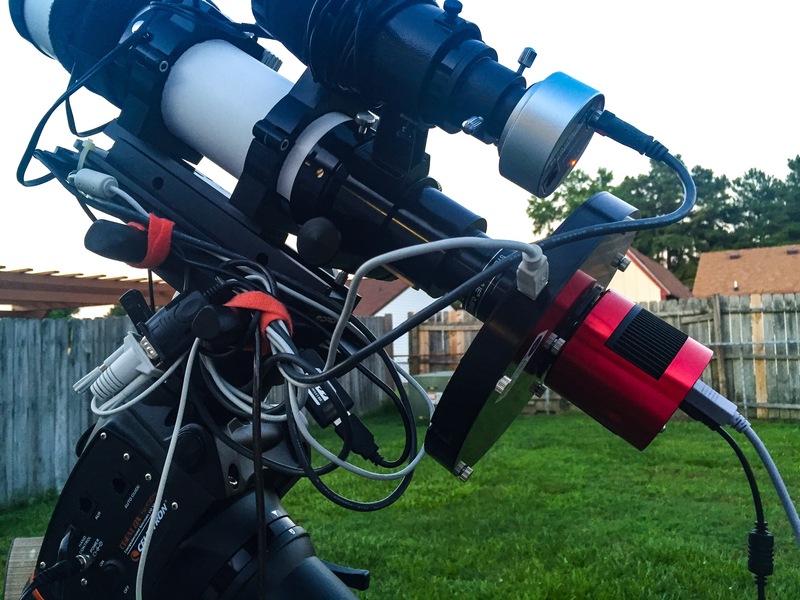 Now, not all objects in the night sky are ideal for narrow band imaging. Galaxies are one example. Galaxies are mostly collections of stars with some neblosity within them. Stars emit light in the broad band. Now, if you look closely at a very well done picture of a galaxy, you might see red blotches within the galaxy. Those are areas of hydrogen emission nebula not unlike M42, the Orion Nebula and countless other local nebulas. Those pictures usually are made up of LRGB and an extra set of hydrogen-alpha narrow band data. Hydrogen-alpha (H-a): YES! Hydrogen. The most common element in the galaxy, no the UNIVERSE! So, what is Hydrogen-alpha? Well, in short, its a very specific wavelength of light emitted by Hydrogen. In visible light, it’s in the red band, however with many narrowband images, including those taken by the Hubble Space Telescope, it’s made green in processing. The famous pillars of creation, that stunning blueish green background? It would appear red in the visible light. Hydrogen-alpha is also used for solar scopes to view the Sun in amazing detail. These are very different filters looking at the same band of light. You can not mix these two however! Oxygen III (Oiii): Oxygen. Wait, I thought people can’t breath in space. Well, they can’t! But, oxygen is made in stars. Oxygen, carbon and other heavy elements weren’t made during the big bang, they are made in stars. And when stars explode, those elements fly through space, condense and along with several other heavy metals form planets and life. Oiii is oxygen that has been doubly ironized, meaning the electrons are dropping two energy levels. It is found in planetary nebula, which isn’t surprising as oxygen is formed in stars, and planetary nebula are made from stars throwing off part of their gas into the surrounding space. It’s also found in diffuse nebula. This is where stars are normally born, and some die. The oxygen is from older stars that have come and gone. This wavelength is found in the blue/blue green part of the visible spectrum. Sulfur II (Sii): Sulfur II is, you guessed it, singularly ironized Sulfur. It’s far into the red spectrum and it’s much fainter than it’s nearest companion H-a. So, now we have discussed the three main filters used in narrow band astrophotography, let’s see what each of those look like alone, and then combined together. 33 stacked Hydrogen-alpha frames, 300 seconds each. 48 stacked Sulfur II subs, 300 seconds each. 33 Oxygen III subs, 300 seconds each. Here is what all three put together looks like. The RGB color mapping is SHO. So Red = Sii, Green = H-a, Blue = Oiii. I am still waiting to get more data before I call this image finished. But I am pretty happy with how its turning out so far and I wanted to share some info about narrow band astrophotography. Thanks for reading! Check out a Full Size image here! The Trifid Nebula, M20. This quickly became one of my favorite objects after being shown it at one of the astronomy club’s star parties. Besides the pretty colors, it also has all three types of nebula. Emission nebula, the red area, reflection nebula, the blue area, and dark nebula, the dust lanes in the middle and faintly seen around the main nebula. This is made up from about 3 hours of data taken with my Celestron C8 and my Canon T3i. I just love this target and I hope to add more data to it over the summer. If you are interested in getting a print of this, Contact me with what size you’d like, if you’d like it on glossy paper, aluminum, canvas or acrylic and I’d let you know the price. This is the Iris Nebula, discovered by William Herschel in 1794. Most of this image is made up of dark nebula. It’s basically dust. This dust obscures the light from background stars. The pretty blue is light from a near by hot star, SAO 19158. SAO 19158 is about 10 times the size of our Sun. This was taken over several days and two star parties. The East Coast Star Party put on by our astronomy club in Coinjock and the Staunton River Star Party. I captured almost 100 frames at 300 seconds each. This was taken with my Celestron C8 on my Celestron AVX. I was having a lot of problems with guiding and I did have to toss some of my frames. This ended up being 7.8 hours of total exposures. Lining everything back up each night was a pain and it took nearly an hour each time and I still had to crop quite a bit. Hopefully next time I shoot this, I can utilize new tools and methods to improve framing. If you are interested in prints, Contact me and tell me what size you are interested in, and I can give you a price. The Horsehead Nebula. This dark nebula with emission and reflection nebulas around the Horsehead are found in the belt of Orion, near Alnitak. This was discovered in 1888 by Williamina Fleming by photographic plate. You might know that name, she helped developed a common method for classifying stars, and she cataloged thousands of stars. This was only about 3 hours of data. Normally not enough to make an image this strong. This was captured with my Celestron C8 reduced, and my stock Canon T3i. This is actually the second time I imaged this target. The first time I imaged this target was with my old 6 inch Newtonian. It’s a beautiful target and I wanted to shoot again. I planned to get more data on this, but the weather wouldn’t play nice and didn’t even get 3 hours. There is always next year! Prints are available. Email me at DJPelzel@gmail.com for prices depending on size and print options. This is the Rosette Nebula,Discovered by John Flamsteed around 1690. The Rosette Nebula is an emission nebula 5,000 light years away. This means is the red areas you see are emitting red wavelengths due to hydrogen being heated by near by stars. This is an area of new star formation. This image is an accumulation of over 7 hours of data collected with my Stellarvue 80mm ED APO and a stock Canon T3i. This was the first real target I went for after receiving my Stellarvue 80mm. This was taken over 3 nights from my dark sky location, a road about 45 minutes from my house. This means packing up all of my gear, running things off of custom made portable power supplies and sitting outside. This object is a winter object, so that means sitting outside for several hours in below freezing temperatures. It can be a lot of fun, but on really cold nights, it can be brutal. Prints available. Hit Contact, tell me what size you are interested in and what you’d like it printed on and I’ll give you a price.